Originally from the village of Novoe of the Yaroslav Province and made in the Rostov-Suzdal school of iconography, this luminous early 14th century masterpiece vividly portrays the ancient Church Tradition about the founding of the use of icons. King Abgar of Edessa, king of a neighboring kingdom of Israel at the time of Christ, sent his court artist to draw His face in a portrait to bring to the king to heal him of leprosy. The artist tried to no avail, and so the Lord knowing all things simply pressed His Face to a cloth and His Image came off on it. He sent it back to King Abgar which did heal him of his illness except for one small spot. After the Resurrection, the Apostle Thaddeus of the Seventy went to Edessa to complete the healing, and then baptized the king and his entire kingdom. Because Christ Himself made the icon without drawing or paint, it is called “Not Made by Hands.” Kept in Edessa until a.d. 944, it was taken to Constantinople for veneration. 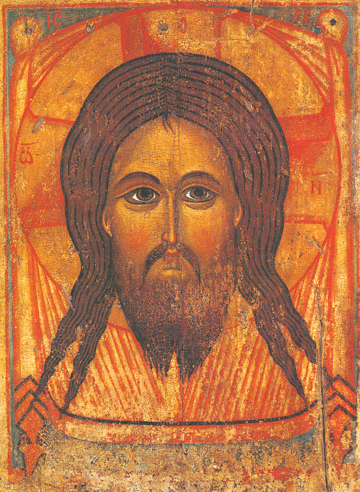 All subsequent icons of Christ are patterned after this icon. It disappeared from the Queen City at the time of the sack of Constantinople by the Western knights of the 4th Crusade.